Dr. Russell received his B.S. degree in Neuroscience from Washington and Lee University. After graduate study in Physiology at the Medical College of Virginia, he earned his DDS from the Baltimore College of Dental Surgery. Following dental school, Dr. Russell completed a General Practice Residency program at the Baltimore VA hospital which has been ranked as one of the nations top post-graduate programs. Dr. Russell had the distinction of serving as Chief Resident during residency and was awarded his ADA Certificate. 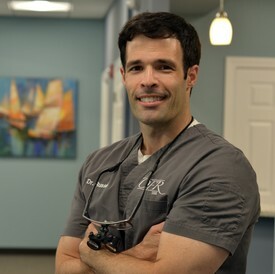 During residency, Dr. Russell underwent advanced study in all aspects of dentistry including Cosmetic procedures and the Surgical Placement and Restoration of Dental Implants. He lives in Annapolis with his wife, Jessica, an OB/GYN with Chesapeake Womens Care, their daughter and son.